On January 10, 2016/ 29 Tevet, 5776, on the Sunday afternoon inaugurating the annual conference of OHALAH: The Association of Rabbis, Cantors and Rabbinic Pastors for Renewal, the ALEPH Ordination Program welcomed five new rabbis, two rabbinic pastors and two hazzanim (cantors) into the lineage of ordained Jewish Renewal leaders. 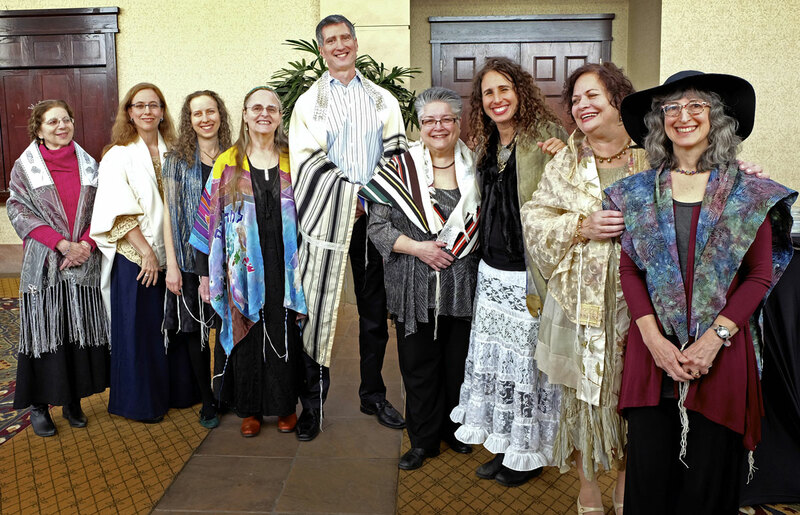 Distinguished rabbis and educators from across the denominational spectrum of Jewish life along with family and friends swelled attendance at the OHALAH conference for the inspiring ordination ceremony. The ordination each year blends the ancient tradition of awarding smicha (ordination) through the “laying on of hands” with the ritual creativity of the students who design the surrounding ceremony. The ALEPH Ordination Program is now the largest of the rigorous liberal seminaries, with an enrollment of 80 students from throughout the US, Canada, South America and Europe. Hazzan Abramowitz attends Congregation Beth El in Bethesda, MD, and is co-leader of its Friday night services. He is co-founder of The Jewish Studio, which offers innovative monthly events for Jewish adults in the Washington DC area. A graduate of Brandeis University and George Washington University, he received a Master in Computer Science and is now senior technical advisor at Trend Micro, a specialist in computer and network security. He served as co-president of the Students’ Organization of the ALEPH Ordination Program and is currently its treasurer, while continuing his training to become a Spiritual Director through ALEPH’s Hashpa’ah Program. Rabbi Cohen is Religious Leader of the Seaside Jewish Community in Rehoboth Beach, Delaware. She graduated from the University of Illinois in Chicago and began her career directing youth programs in synagogues. After receiving her Master of Business and Public Administration degree from Southeastern University in Washington, DC, she worked in several nonprofits as Head of Finance and Executive Director, while continuing to be active in synagogue as worship leader, creator of liturgy, teacher, and board president. She also served as President of the World Congress of Gay and Lesbian Jewish Organizations. Rabbi Eisenberg is the cantorial soloist and adult educator at Temple Sinai in Brookline, MA, and has served as spiritual leader for Conservative, Reform, and unaffiliated communities. She received her M.A. in Jewish Education from the Jewish Theological Seminary in NYC, and has led adult, b’nei mitzvah, and youth programs at many congregations, and for Combined Jewish Philanthropy, Vilna Shul, Limmud, and the National Havurah Institute. Rabbi Eisenberg studied voice at Juilliard and at University of Washington and is a recording artist and producer of award-winning classical CDs, as well as a liturgical composer, dancer and choreographer. She is also a certified chef from the Natural Gourmet Institute and a healing energy practitioner of Jin Shin Jyutsu. Rabbinic Pastor Gohr serves as chaplain at the Lehigh Valley Health Network in Allentown, Pennsylvania. She works primarily with trauma, neuro-science, and burn patients but is available hospital-wide for patients from all faiths and walks of life. In 2012, she was ordained by ALEPH as a Mashpiah Ruhanit/Spiritual Director. She also serves as cantor at Temple Or Chadash, a Reform congregation in Flemington, New Jersey. She provides music for worship and religious school, tutors b’nei mitzvah students and teaches sixth and seventh grade Hebrew. Rabbinic Pastor Kaplan’s journey of spiritual service began when working as a financial services partner for Deloitte Consulting in NYC. In the aftermath of 9/11, she facilitated trauma counseling sessions and helped with pastoral care. She has served as a clinical and community chaplain since 2008 and has led services and educational programs for Jewish congregations in Germany and the U.S. Her research includes applied digital and information ethics, as well as kosher dietary laws and ritual slaughter. In 2014, she was ordained by ALEPH as a Mashpiah Ruhanit/Spiritual Director. She is a founding member of Teaching Peace International, an Israeli-Palestinian nonprofit that combines MBA studies with nonviolent communication. She is currently the Director of Enterprise Constituent Relationship Management (CRM) for the University of Colorado. Rabbi Mosenkis has been a Mashpiah Ruchanit/Spiritual Director since 2012, trained through ALEPH’s Hashpa’ah Program, and a Soul Memory Discovery facilitator since 2005. She has led a weekly meditation group for over a decade and, through a STAR grant, meditative Friday evening services at the Germantown Jewish Centre where she also co-led a contemplative Rosh Hashanah morning service for the Minyan Dorshei Derech. She served as rabbinic intern at P’nai Or Philadelphia and Martins Run Life Care Community, where she led monthly Shabbat evening and morning services and offered pastoral care. Nahariyah plans to teach contemplative practice, Jewish spirituality, and prayer. Rabbi Sax-Bolder provides spiritual seekers with joyful, creative approaches to Judaism through her independent rabbinate, Nishmat HaLev. Alongside her four-decade career as a speech and language pathologist, she has been a longtime Spiritual Director, trained by Lev Shomea, and trained as a chant leader through Rabbi Shefa Gold’s program, Kol Zimra. She is an alumna of CLAL’s Rabbis Without Borders, and has completed certifications as a Jewish Mindfulness Meditation teacher, ‘Age-ing to Sage-ing’ facilitator, Wise Eldering facilitator, and Jewish yoga teacher, and also served as the assistant spiritual leader at Temple Beth El of City Island, Bronx, NY. Rabbi Smith is the founder and spiritual leader of Or Ha Lev Jewish Renewal Congregation in Morris County, NJ. She is a clinical social worker and multicultural family therapist, and a past recipient of the Leo Brody Jewish Communal Service Award. A central focus of her work is “Deep Ecumenism” and multi-faith dialogue. She co-chairs the New Jersey Muslim-Jewish Solidarity Committee and the Morris County, NJ chapter of the Sisterhood of Salaam-Shalom, and co-facilitates Jewish-Christian and Jewish-Muslim dialogues with local pastors and imams. She will join the adjunct faculty of Drew University Theological Seminary as a teacher of Jewish spiritual practice for their Christian students. Posted in ALEPH / Jewish Renewal Listening Tour, Deep Ecumenism, General Interest. Bookmark the permalink.